Amarilla’s Grandmother Keller Passes 1882! 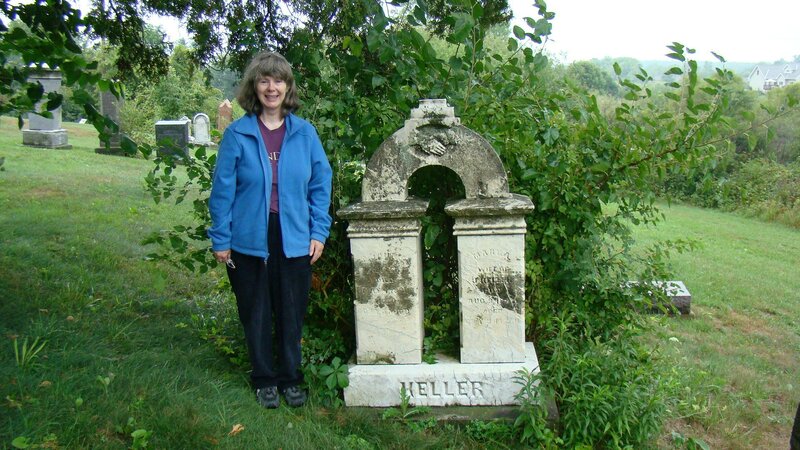 Amarilla’s grandmother Mary Ann Delano Keller died on 3 Aug 1882 in Morrow Co., Ohio. I have not found anything in the death records for Morrow County about her death like I did for John Keller, her husband. 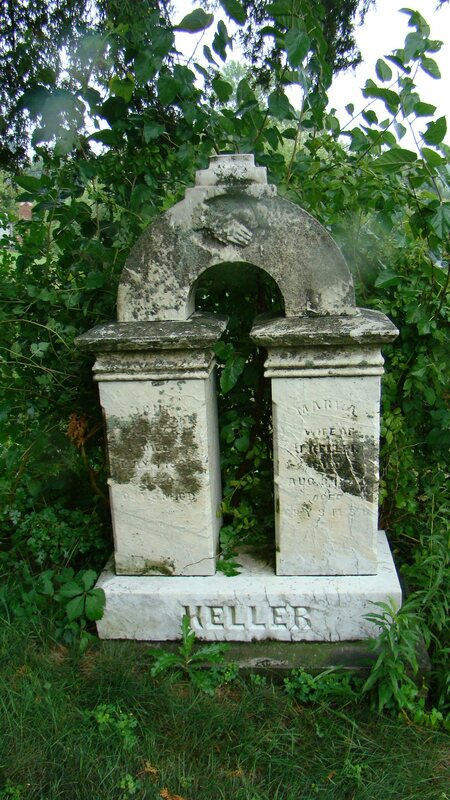 Mary is buried with John Keller in the Hedding M.E. Cemetery in Morrow County, Ohio. I featured that tombstone in the posted dated March 25, 2011 on John Keller’s death. Mary Anne Delano and John Keller married on 5 March 1831, per the marriage records of Knox Co. or on 15 Mar 1830 per Hse of Delano book in Fredericktown, Knox Co., Ohio. Source: Marriage Records 1808-1851, Probate Court, Knox Co., Mt. Vernon, Ohio, FHL#1294304 1808-1853. There is information about the family in the book: The Genealogy, History and Alliances of the American House of Delano 1621-1899, by Major Joel Andrew Delano, Part IV, New York 1899, pg. 426 to 427. There is one submission application for Stephen Delano (Sr.) at the DAR Library. It is an original application to DAR under Elizabeth Delano, daughter of Stephen Delano and Mary Shaw, and a sister to Stephen Delano, Mary Anne Delano Keller’s father. You can search for this information at the DAR website it will cost to purchase a copy. My Aunt Miriam was a little confused. She was mixing up membership in the DAR (Daughters of the American Revolution 1776) with membership in Mayflower 1620. Two very different and separate hereditary organizations. Miriam is correct there is DAR and Mayflower in Amarilla’s lineage through the Delano family and the Goss family. I have found a copy of the source book that Miriam mentions from the Boston Public Library and it is close to what was written. The date is 1973 and a lot more information and sources are available today. There are green books from the General Society of Mayflower Descendants, 1999 that were written by Muriel Curtis Cushing that feature the descendants of Philip Delano of the Fortune 1621 and his descendants for four generations to Stephen Delano born 1748. The other book is the the fifth and sixth generations numbers 198-367 Part I 2004, which does not cover our family and so far I do not see that Part II has been published at this time. They are a hereditary organization for Delano descendants. Ms. Cushing is up for President of this organization in 2011. Their membership is not that expensive or is it hard to join. I have yet to submit my family line to them but plan to soon. You will find information at their website. They have annual reunions. As a member I have access to the membership list, a copy of the Delano book I mentioned above and information on what is going on regarding the research on the Delano family. On 4 May, 1880 John Keller, Amarilla’s grandfather, passed away from stomach cancer. John Keller was the father of Amarilla’s mother Elizabeth Keller Spracklin and the husband of Mary Anne Delano Keller. How this death affected Amarilla is unknown and whether she even knew her grandfather is also unknown. Amarilla was 21 years old at his death or about that age. The grandparents had settled in South Bloomfield Twp., Morrow County, Ohio. Morrow County, Ohio was a composite of several counties: Knox, Richland, Marion and Delaware Counties. It was established in 1848. Birth and death records were not recorded till 1867, marriage started 1848 by the county. Apparently there was a great deal of protest about the formation of Morrow County at the time. John and Mary Keller had eleven (11) children. Elizabeth Keller was their oldest and first-born. 1. Elizabeth Keller born 4 Aug 1831, probably Sparta, Knox Co., Ohio married Daniel D. Spracklin (license issued 31 Dec, 1852) and marriage solemized on 1 January, 1853 in Sparta, Morrow Co., Ohio and died in Benson Co., Iowa near Blairstown/Marengo 1859. Buried in Titler Cemetery northwest of Marengo. This is Amarilla’s mother. 2. Susan Keller born 3 Nov. 1832, Sparta, Knox Co., Ohio d. 20 June 1834, Sparta, Knox Co., Ohio, burial unknown. 3. Peter Keller born 28 Nov. 1834, Sparta, Knox Co., Ohio married Eliza Ann Everts 6 July 1957 in Sparta, Morrow Co., Ohio. Peter died 22 May 1869 in So. Bloomfield Twp., Morrow Co., Ohio and is buried with his parents in the Hedding M.E. Cemetery in that location. His information is listed on the left side of the parents tombstone. Peter and Eliza had 5 children. It is possible she remarried to a Mr. Denzer. Peter served in the Civil War and I believe he died because of his wounds. I have not obtained his Civil War service or pension record at this time but might when I visit Washington D.C. in June 2011. NOTE: The History of Morrow County in various versions is online at Google Books. 4. Lovinia Lavinia Keller was born 17 Feb 1837 in Sparta, Morrow Co., married William Golf Helt on 17 Feb 1855 in Morrow Co., Ohio and died 22 Dec 1837 in Sparta, Morrow Co., Ohio. They had 8 children. I believe William died before 1883. 5. Amarilla Keller born 28 Mar 1839 in Sparta, Morrow Co., Ohio and married Harrison Barr on 12 Sep 1858 in Sparta, Morrow Co., Ohio. They had about 9 children. Amarilla died 12 May 1915 in Galion, Crawford Co., Ohio and Harrison was before 1910 in Polk, Crawford Co., Ohio. 6. Caroline Keller born 28 Nov 1841 in Sparta, Knox Co., Ohio married Joseph Higgs Van Houten on 1 Dec 1857 in Morrow Co., Ohio. They had 5 children. Caroline died 2 Jun 1902 in Washington Twp. Hardin Co., Ohio and Joseph followed in 29 Jan 1903 in the same location. 7. John Delano Keller Jr. was born 22 May 1844 in Sparta, Morrow Co., Ohio and he probably married Mary L. Carson about 6 Dec 1868 in Morrow Co., Ohio. He died 4 Jun 1876 in Fredericktown, Knox Co., Ohio. 8. Mary Ann Keller was born 16 Dec 1846 in Sparta, Morrow Co., Ohio and died sometime after 1900. She married an Alexander Shaffer on 24 Jun 1866 in Morrow Co., Ohio. They had about 9 children. I have reason to believe they moved to Richland Co., Ohio to live. 9. Henry Keller was born 29 Mar 1849 in Sparta, Morrow Co., Ohio and married Martha Kees (Keyes) 28 Oct 1871 in Morrow Co., Ohio. Henry died after Aug 1909 in Morrow Co. and Martha followed in about 1927. They had 2 children. 10. Harriet Ellen Keller was born 15 Mar 1852 in Morrow Co., Ohio and married 3 Jan 1875 in Morrow Co. to John Lacy. She died 22 Mar 1920 in Dresden, Muskingum Co., Ohio and he followed after 1930 in the same location. 11. William Franklin Keller was born 15 Sep 1855 in Fredericktown, Knox Co., Ohio and married on 22 Dec 1880 in Galion, Crawford Co., Ohio to Ida Catherine Riblet. They had 3 children. He died 2 Feb 1911 in Morrow Co., Ohio and she followed on 16 Nov. 1930. Sources for these children have been the U.S. Federal Census 1830, 1840, 1850, 1860, 1870, 1880, 1900, 1910 etc for Knox and Morrow Co., visiting cemeteries and tombstones – Book: Cemetery Inscriptions for Morrow Co., Ohio Vols 1-6. A book: The Genealogical History and Alliances of the American House of Delano 1621 to 1899, pg. 426. (This book gives Sparta as the birth place of many of the children), Deeds from Morrow Co., and Knox Co., Ohio., on-line family trees, message boards, marriages – Marriage Records, 1848-1951, Morrow Co., Ohio. Repositories have been the Family History library, Morrow Co. Genealogical Society and more. Death records for Hardin Co., Ohio. and Probate/Estate Records for Morrow, Knox and other counties. These are the highlights of the sources I have consulted for this family. Note: If you are particularly interested in one of these family lines please contact me for more specific source details and family links. Place a message in the comments to me and I will respond. I am still trying to learn more about each sibling so the reseach is ongoing. I plan to travel again to Ohio in August/September 2011 and hopefully I will learn more about Elizabeth Keller’s siblings, parents and Amarilla’s aunts and uncles. The most important search will be to see if I cannot figure out the parentage of John Keller the grandfather and father of these children who have been listed. He is said to have been born in Washington Co., Pennsylvania and his death record with Morrow Co. states the same but gives no parents names. So far I have not been able to make a connection. Washington County, PA was like a pass through to other parts of the country so they could have just stopped to have the baby and then moved on. At least this is my theory and the real parentage of John Keller is somewhere in the records in Ohio in Knox, Morrow, or one of the nearby counties? There were lots of Keller families living in Ohio. John did have a will and estate that was probated in Morrow Co. Usually the clerks are very careful but some of the documents from the clerk books for John’s estate are very difficult to read. Amarilla is not mentioned in any of these estate documents. Source: Probate Records of Morrow Co., Ohio 1848-1926, and General Index 1848-1950 #388711, No. 1376, FHL#388711 for Index, Record of Wills FHL#288713 Vol 3, pg. 297, proof of will pg. 297. page 298 not titled but probably Proving of the Will. Pg. 445 FHL#388724 Affidavit (hard to read) probably filing of the will. Note: More needs to be done on this estate in the books and packets. Mt. Gilead – Morrow Co. Sentinel Newspaper 1/1/1879 to 4/28/1881 Thurs, June, 10, 1880 Under New Advertisements: Executor’s Notice – Notice is hereby given that the undersigned have been appointed Executors of the last Will and Testament of JOHN KELLER, late of Morrow County, Ohio dec’d. All person indebted to the estate are requested to make immediate settlement. MARY A. HENRY, WM. T. KELLER (Ex’rs. June 10, 1880 (40-3w). NOTE: I do not know who Mary A. Henry is? Did Mary his wife remarry or do we have another error? Back in 2007 the Federation of Genealogical Societies and Association of Professional Genealogists held their conferences and Ohio was not that far from Fort Wayne, Indiana. So I visited the counties of Hardin, Knox, and Morrow in Ohio and spent some enjoyable time there. I will return in 2011 and see if I cannot find more treasures. I also found and visited the Hedding M.E. Cemetery in Morrow Co.
As you can see the bush is trying to topple the arched stone and when I visit again I will make sure that things are okay. The stone also has a lot of mold on it and Peter’s information is on the left side next to me but covered in this mold and hard to read. The stone is near a big tree so it is shrouded in shade. A cousin had sent me a copy of the tombstone years ago (a descendant of William Franklin Keller) and I thought it was huge but you can see that is about my size and rather unique. Just click on the photo and you can enlarge it to read it and make a copy. John is on the left and Mary is listed on the right front columns.